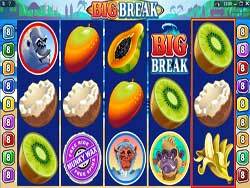 Playing Big Break slot feels like catching a thrilling ride on a monster breaker in Hawaii…and there’s even a possibility of winning up to 75 000.00 coins on the way in. There is 3 ways to win - Lucky Break, Big Break and Munky Wax - the game is full of free spins with more spins within, multipliers and bonuses, all wrapped in a comical surfing apes theme carried by vivid and colorful graphics depicting a tropical paradise surfing spot! When you’re down at the beach; make sure to look out for the second screen bonus, which is triggered when 5 mischievous monkeys appear across the 5 reels, opening up a further beach scene where the player is invited to grab a board and ride the tide to big bucks.